At St. Mary, we have many opportunities throughout the year for Adults to continue to grow in their faith and love of Christ through continued study of the bible, lecture series, guest speakers and always through our RCIA (Rite of Christian Initiation) Program. Please call the parish office with any questions 540-373-6491. 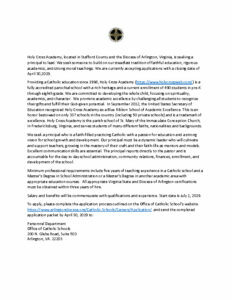 Our RCIA Program is Open to all Catholic’s wishing to know more about their faith. The Remaining schedule of classes is listed below. Please join us and support those in our RCIA program through your presence and prayers! To learn more about current adult education programs, call the parish office with any questions 540-373-6491. You will not only benefit personally from being part of this adult Bible study; you will also help us to grow in fellowship as a parish as we grow closer to Christ together. Cost for study materials is $17.00, collected at the first class. Wisdom invites you to experience the transforming power of taking time to apply God’s wisdom to your own life. You will learn to see with his vision. You will experience the peace of knowing God cares for you, andyou will see how God—and only God—can show you a path through any circumstance. Participants of Wisdom will receive a journal and will meet every week to view an engaging video presentation followed by a time of lively group discussion and fellowship. The eight 30-minute videos, presented by Jeff Cavins, will guide you through a variety of themes drawn from the wisdom literature of Scripture. Jeff will explain Scripture’s wisdom on decision-making, finances, relationships, peace of mind,and speaking to one another and will look at the beauty of wisdom gained through age and at how Christ himself is the embodiment and fulfillment of all wisdom. Walking with Purpose women’s Bible study is beginning a new session this fall: Opening Your Heart. This foundational, 22-week course is designed for women who are new to WWP as well as those with more Bible study experience. We welcome past participants and invite new women to join us! Walking with Purpose is a Catholic Bible study that aims to bring women to a deeper relationship with Christ. The course involves personal study and small group discussions that link our everyday challenges with solutions given to us through the teachings of Christ and the Catholic Church. Be a part of a Catholic women’s group that will help you grow in your faith. Preregistration is not required; book information will be given at the first meeting. Come and see what we’re all about! For more information contact Lori Mattson at lori@acumen-ea.com and/or go to walkingwithpurpose.com. The Bible Timeline is a fascinating study that takes participants on a journey through the entire Bible. They will go deep into each period of salvation history and discover the amazing story woven throughout all of Scripture. Using a unique color-coded system, they will learn the major people, places, and events of the Bible and see how they all come together to reveal the remarkable story of our faith. The cost for materials is $25. Class sizes will be limited to 40 participants each. Sign up in the Parish Office, 540-373-6491. We’re hoping to offer The Prophets: Messengers of God’s Mercy in January 2018 (10 Weeks).